Are you wondering about my title? The initials are my daughters and boyfriend, Amanda & Andy. They wanted some wall art and Amanda and I were craft shopping together so we thought about making these cardboard letters for her wall. She is busy working and has no where to create so I was happy to make them for her!! The letters are a bit over 2 feet and are cardboard. 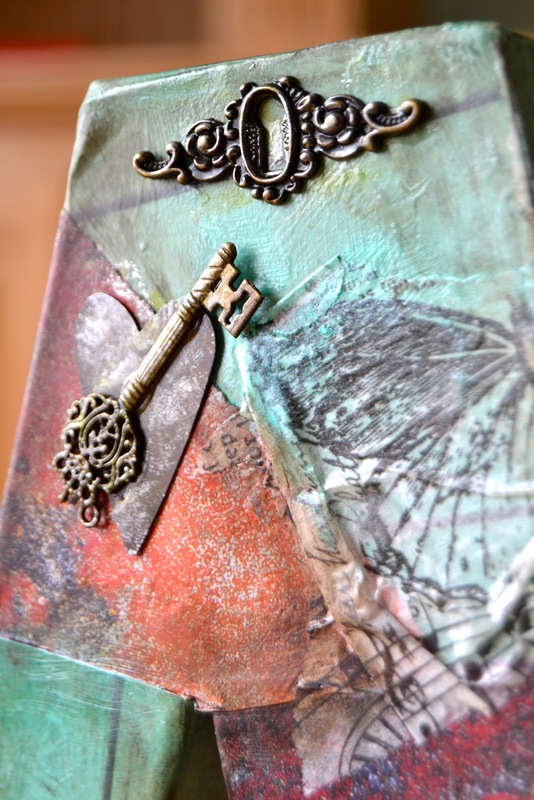 I tore strips of paper and Tim Holtz Melange and then mod podged it on. My fingers were so sticky and I could peel the glue off in the form of my hand I had so much on. I did the Melange last as the tissue is fun to place and dab with the sponge of mod podge. Then I used my Gelatos and edged everything to give it a distressed and blended look. I used some chipboard I received from Southern Ridge, Karen makes the most awesome chipboard. She is very creative with her designs and they are always changing. So I painted the swirls and added distressed metallic paint in silver and bronze to them. 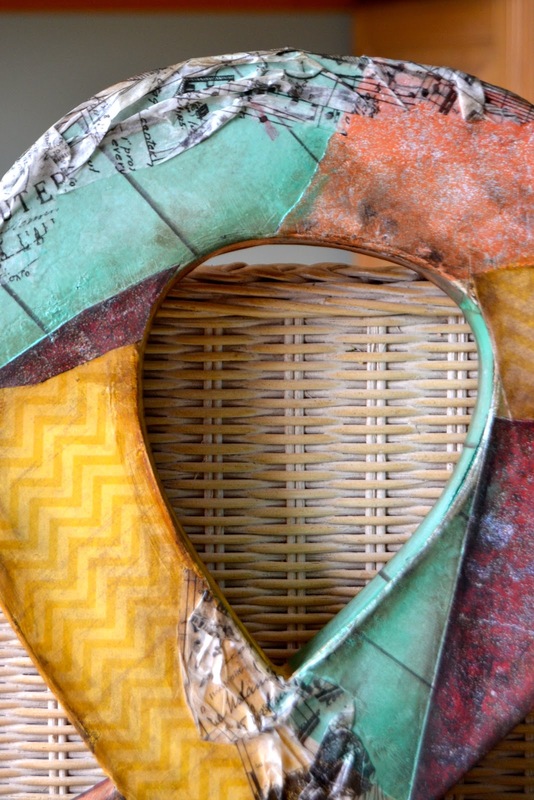 This chipboard heart in the frame is Frantaged with Copper and a touch of green. Here is a nice piece of stiff melange on top of the & and also in the middle. Here is the other swirl I painted and added distress metallic paint in bronze to it. 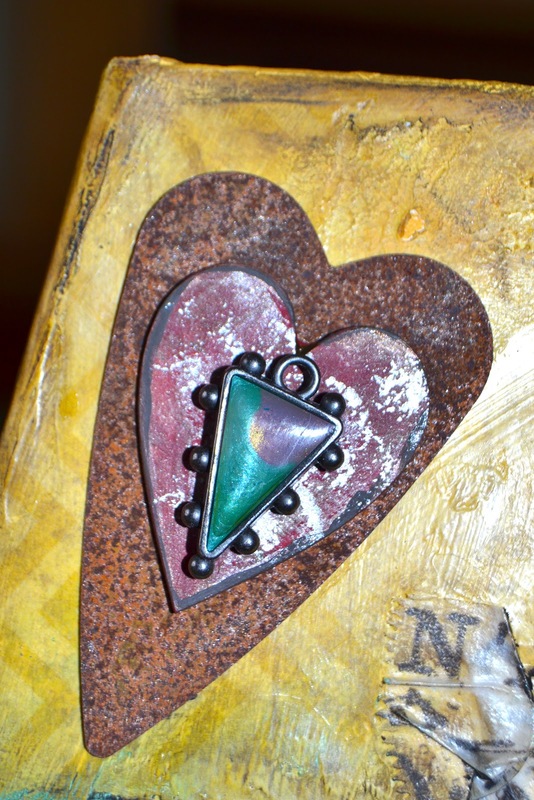 I had this metal rusty heart and topped it with a chipboard heart that I painted and inked..then added a bezel I created last fall with Peebeo paints. 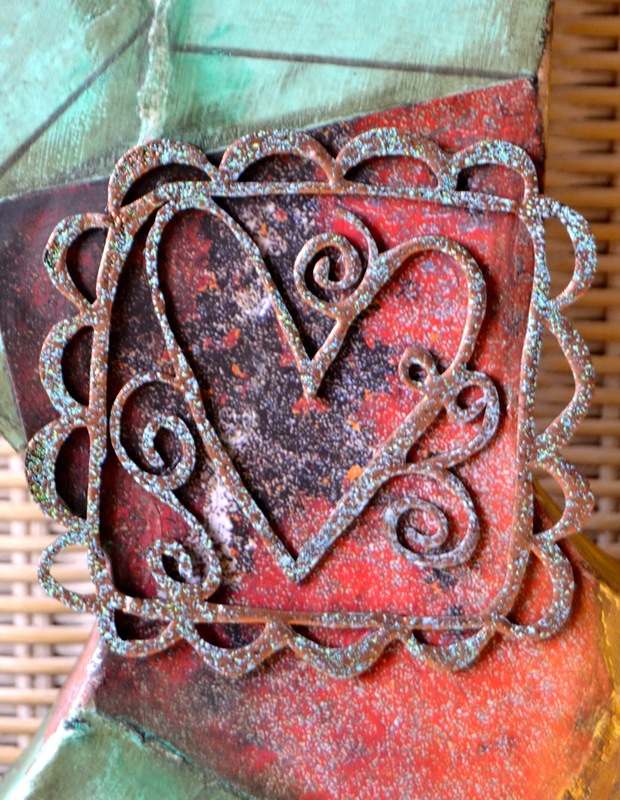 Here is another metal heart with the metal key and key hole all distressed with alcohol inks and distressed metallic paint. It was time consuming but easy to do. I would like to see the letters fixed onto a black canvas and hung that way that would really set the colors off! I sure hope you all have a fabulous lovely Valentines day with your sweeties!! Happy Valentines day to all my blogger friends. Oh fab creation, so many details, love all the metail things ! Happy Valentine's Day too ! These are so cool, Kelly - what wonderful papers and the added embellishments and texture from the Melange all look brilliant. What amazing wall art for the two As! Happy Valentine's Day to you too! I know how much you love doing these kind of projects and it shows. Amanda loves this I am sure in her new home! These turned out so pretty! I am sure Amanda is gonna love them! WOW, girl, you created some fabulous wall art for your daughter.....lucky girl!!! I looooove it!!!! Happy Valentine's Day, dear heart!!! How creative Kelly. I love this collage technique on the letters, gives dimension and so much beautiful bouncy colors. Love the idea of the initials. Absolutely fantastic. Have a happy valentines day... even if I am very late. Hugs. Happy belated Valentine's Day! Opps! Wow country sista these letters are scrumptious! Lovely DP's and textures and of course your embellishments are totally delightful! I bet your daughter had a huge smile when she laid her eyes on these beauties. You're a fantastic Moma!!!! And a very talented one too! Your letters are gorgeous! Love all the embellishments you added. I am sure she will cherish them.